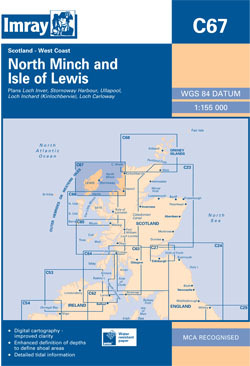 The west coat of Scotland from Rubha Reidh to Cape Wrath, and the Isle of Lewis including North Harris and part of South Harris. Scale: 1 : 146.000. One-minute gridlines. Larger scale plans of Loch Inver, Stornoway Harbour, Ullapool, Loch Inchard (Kinlochbervie) and Loch Carloway. This 2013 edition has been fully updated, using the latest known depths throughout the chart.